How Much Money is Just Enough for You? Your final college award letter will provide you with information concerning the status of your financial aid, including any Federal loans for which you have qualified as well as any grants and scholarships which you may have been awarded. Keep in mind that, unlike grants and scholarships, all loans must be repaid and you want to avoid taking on more debt that you can handle. Restrict any and all loans to the lowest dollar amount possible. Attractive "college expenses" loans for high dollar items like computers and textbooks may sound appealing, but those loans will accumulate and will be steadily accruing interest while you're in school. You will responsible for repayment on all loans to which you have agreed, and your future entry-level salary may not be enough to cover the excessive monthly payments. Cost of Attendance, or COA, refers to the reasonable total amount of money required to complete one full year as a full time student. This includes tuition, textbooks and room and board. Consult your college for a detailed evaluation of your expected COA, and in combination with your unmet need figure calculate how much money you will need to borrow. If you've been approved for a Federal Work Study Program, work out an estimate of how much money you will be able to earn to put towards paying for your educations costs. Work out a budget plan and stick to it. All Federal subsidized and unsubsidized loans have annual and lifetime (aggregate) limits. These limits are determined by a number of factors, including degree status, year of attendance and whether you are a dependent or an independent student. Your college financial aid adviser can provide you with information specific to your loans to determine the yearly and aggregate limits that pertain to you. You may not borrow more than the total cost of your attendance, less any any other financial aid you have secured. If you have received a Stafford or FFEL loan, either subsidized or unsubsidized, these will be combined with any other financial aid you have secured to make up the total amount of your loans. Consequently, your Federal loan totals may actually be less than the standard yearly or total limits. When calculating your education budget, you will need to take into account all of your current financial obligations: car payments, credit card bills, insurance, rent, grocery and utility bills. These monthly financial commitments will need to be covered by income, or savings, separate from any college loans you are receiving. Student loans are first, and foremost, for your education costs. Never use college loan money, either Federal or Private, to pay for your living expenses. That way lies debt, and/or default. Subtract all out of pocket cash, college savings, grant and scholarship money you've been awarded from the figure you initially thought you'd have to borrow. You'll quickly realize the value of grant and scholarship money—gift aid that can significantly cut the cost of your education. Don't stop with institutional grants and scholarships. Search for and apply to outside scholarship sources for additional free aid. 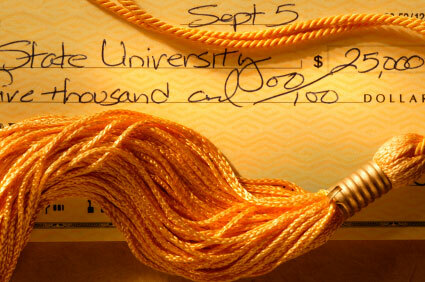 Even scholarships offering smaller awards can help defray the costs of your college education. Look for local and unusual scholarships that may help you add to your education fund. It is important to be realistic about the debt you will have accumulated by the time you complete your college education. Estimate how much student loan debt, both Federal and Private, you will have amassed in two or four years of college. Next find out what a newly graduated student in your field is likely to earn in an entry-level position. Subtracting rent, car payments and any other living expenses from your projected earnings leaves you with the funds you will have to pay off your student loans. How carefully you budget, and how accurately you are able to foresee and prepare for your future debt is critical to how much you choose to borrow from any lender. Always apply for Federal student loans first, as much as you can get, first in subsidized then unsubsidized Stafford Loans. Only borrow what is absolutely necessary to pay for college. Private student loans should be your final option. Don't get carried away with loans that promise to cover all your extra college expenses. Evaluate costs, ask questions and never borrow more than you absolutely need.